Preheat oven to 200°C/400°F. Slice tomatoes. 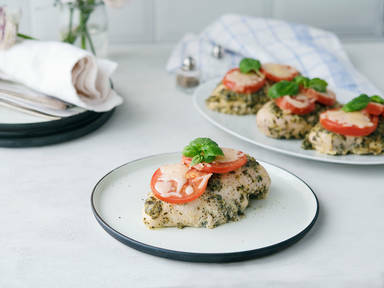 Place chicken and pesto in medium bowl; toss to coat. Place chicken in large ovenproof frying pan or on baking sheet lined with heavy-duty foil. Bake at 200°C/400°F for approx. 20 – 25 min, or until chicken is no longer pink in the center. Remove from oven. Top chicken with tomato slices and cheese. Bake for approx. 3 – 5 more min., or until cheese is melted. Garnish with fresh basil, if desired. Enjoy!